Gotham Gold takes a knee during the US national anthem at the 2018 Bingham Cup, Amsterdam, NL. 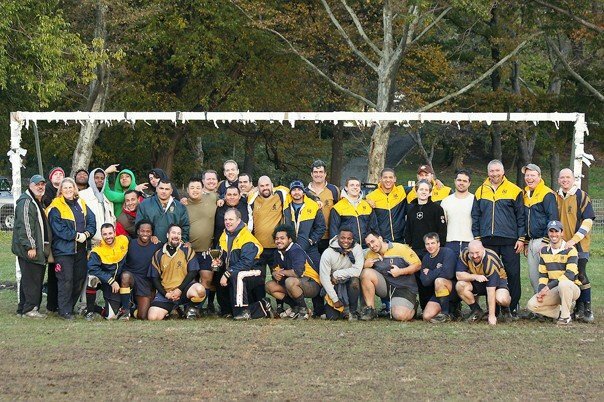 Gotham Knights RFC became New York's entry into the growing ranks of inclusive rugby union teams worldwide. 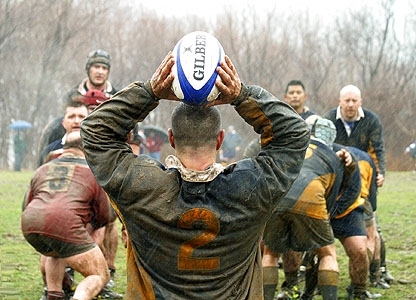 Following the tradition of International Gay Rugby (IGR) teams like the London Kings Cross Steelers (1995), San Francisco Fog RFC (2000), and the Washington Renegades (2000), recent part-time New York City business owner and Fog player, Mark Bingham, discussed with local rugby player Scott Glaessgen the prospect of founding a team in New York. At the time, their plans were cut short on September 11, 2001, when Mark was lost in the terrorist attack on United Airlines Flight 93 over rural Pennsylvania. At that time, Gotham applied for a membership in the Met New York Rugby Union; it was Gotham’s official incorporation into a New York rugby union league. Warm spring weather in New York City led the Knights into more intensive practices during the months of March and April under coach Glaessgen. The team added assistant coach Mio Nitta, formerly of Tufts Rugby, as well as a steady influx of new recruits. Club-wide social events coalesced Gotham into the New York’s rugby community. Gotham members continued intensive recruitment around the New York metro area, creating a fan base and inviting sponsors to promote and support the team. With the club’s evolving need to get better at rugby, Australian Geoff Quinn was invited to be Gotham’s first head coach for the fall 2002 season. In 2003, Steven Cain became head coach with assistance from Harold Bahr, who subsequently took over as head coach between the fall 2003 and fall 2006 seasons. The Knights celebrated their first win over union opponent Suffolk Bull Moose RFC on September 2004. It was during that time when players Keiran Lanham and Callum Sigg shared head coaching responsibilities. In 2007, Peter Rizzo became head coach until his departure to Brisbane, Australia in 2008 to continue his involvement in the sport of rugby as referee. Consequently, Spencer Blake stepped into the breach as a player-coach in the fall of 2008. Jeff Simpson, now a prominent referee, was head coach during a period of team reestablishment in 2009 succeeded by Philippose Kyriacou in late 2009. Lenny Pereira (2011), Bob Hoban and NYRC's Junior Blaber held coaching positions between 2011 and 2013. For the 2014 Spring season, Ottawa native Sebastian Cray became Gotham's most recent head coach. Cray is well experienced in the sport having played rugby for 14 years and coached for 6. He began his journey at Lisgar Collegiate in Ottawa, Canada and, subsequently, played for a number of clubs including: the Ottawa Beavers, Rockford Ravens, East-side Banshees, Madrid Barbarians, and, of course, the Gotham Knights. His coaching career initiated at his Alma Mater, Lisgar Collegiate while also coaching the representative Eastern Ontario Under 16 team in the national championships before moving to New York and taking up his head coaching position with the Gotham Knights. His continuous training support allowed Gotham to grow more competitively and determined raising Gotham’s ranking in the D-III Empire GU of New York rugby union. Throughout the years, Gotham has delivered a strong representation in tournaments locally, nationally and internationally. Every November from 2002 through 2008, the Knights hosted the East Coast Rugby Invitational, a rugby union tournament featuring both traditional and predominantly gay rugby teams from across the eastern region of North America, and later incorporating college teams. In 2006, the Knights hosted the Bingham Cup, a biannual International Gay Rugby tournament organized by members of IGR. Held over Memorial Day weekend, a total of 29 teams from 22 clubs and 6 countries participated in various divisions, including the Bingham Cup's first ever women's division. With over 800 registered participants, this was the largest Bingham Cup tournament to date. Earlier in 2004, the Knights advanced to the quarterfinals at the 2004 Bingham Cup held in London while the B side was runner up for the Bingham Plate. In 2006, the Knights A side advanced to the semifinal round of the Cup division finishing in 4th place while the B side placed 4th in the Plate division. Gotham continued to reap more success back in New York when in the fall of 2007 season the Knights finished 2nd in the union —the first time a predominantly gay team has reached the championship finals in the Met NY Rugby Union. The Knights competed in the Territorial Playoffs in April 2008, until they were defeated by the South Buffalo Thugs. In June 2008, the Knights traveled to Dublin, Ireland to compete in the 2008 Bingham Cup. Gotham competed in the premiere Cup division. In the pool play, the Knights easily dispatched the Boston Ironsides (50 – 0) and San Francisco Fog’s B-Side (39 – 0) but lost in a close match against the Kings Cross Steelers' A-side (8-16), who placed second overall. In the knockout rounds, Gotham defeated perennial rival Washington Renegades (10-0) but lost a hard-fought semifinal match to eventual world champion Sydney Convicts (10-35). The Knights delivered an honorable game as they were the only team to score a try against the Convicts in that tournament. In the consolation final, the Knights beat the San Francisco Fog’s A-side (8-5) in dramatic fashion, with the winning try scored on the last play of the match. The win clinched the Knights third overall in the tournament and earned them bragging rights as the top inclusive rugby team in North America. In 2010, the Gotham Knights A-side won the Bingham Cup in Minneapolis, Minnesota. The Gotham B-side placed 2nd in the Crest division winning 4 of their 6 scheduled matches, only losing by 2 points in the final against the Phoenix Storm. 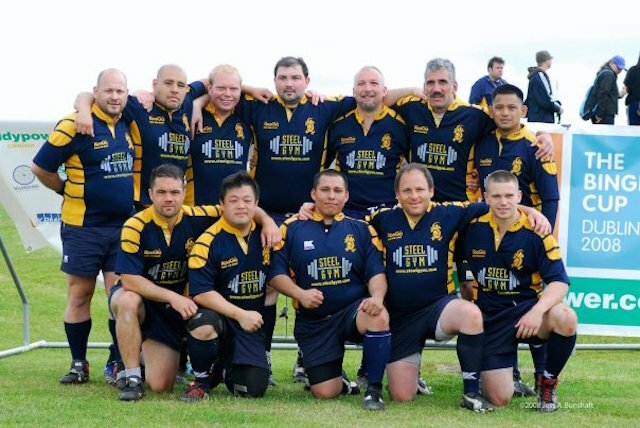 At the 2012 Bingham Cup held in Manchester, England, Gotham Knights A-side finished 4th place losing to San Francisco Fog in the semi-final. For the 2014 Bingham Cup, the Knights converged in Sydney, Australia. That late August, the Knights stepped on the fields as they faced the toughest competition in the tournament yet. Gotham faced tough matches against Sydney Convicts, Atlanta-North Carolina Royal Bucks, London Kings Cross Steelers and San Francisco Fog. Once again, Gotham competed in the premier cup division of the tournament. In the end, Gotham made it to the Bingham Plate semifinals in a close match against the San Francisco Fog. 2015 was a year of many successful projects for Gotham. Among theses were: a front cover and full page feature on The New York Times sports section, the award winning short documentary "Queens and Knights" by Sandra Chuma and Nyasha Kadandara of Columbia Journalism School and a compelling article in French magazine Le Monde by Jean-Philippe Leclaire. While on the pitch, Gotham achieved the best Fall season score board in years finishing in 3rd place on the Empire RFU GU of New York. The Knights recently competed in the International Gay Rugby Tournament, the Bingham Cup, held in Nashville, Tennessee over Memorial Day Weekend. Over 40+ gay/inclusive clubs and more than 1,300 rugby players converged in one of the world's largest rugby tournaments. The Knights delivered a strong performance placing 5th in the overall rankings, beating perennial pitch rival London Kings Cross Steelers in the Bingham Plate final. Currently, the Knights are training for the 2016 fall season.